Hardware is the jewellery of the home. Whether you are building, renovating or repairing, see us for hardware that will suit the style and décor of your home. We supply trade and retail customers. Our extensive experience and Total Service will guarantee satisfaction on all commercial projects. 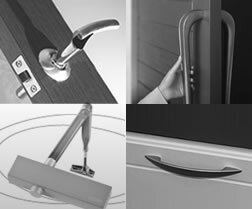 We represent all major hardware suppliers and have a specialist installation team. We have an extensive range of traditional and contemporary cabinetware for furniture, kitchens and other applications. See us for something different or for a hard-to-find item.